Afghan security forces arrive at the site of a suicide bomb attack in Kabul, Afghanistan, Nov. 20, 2018. 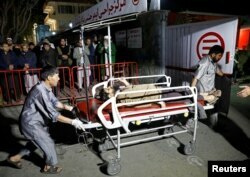 Afghan officials say at least 50 people were killed and 83 others were wounded in a suicide bomb blast at a gathering of religious scholars in the capital, Kabul. Interior Ministry spokesman Najib Danish said the attacker detonated his explosive-laden vest as people were gathered to mark the Prophet Mohammad's birthday at a local wedding hall. Hospital workers carry an injured person to a hospital after a suicide attack in Kabul, Afghanistan, Nov. 20, 2018. President Ashraf Ghani condemned the “horrendous” attack. He declared Wednesday as a national day of mourning, saying the national flag will be flown at half-staff all in Afghan and diplomat missions abroad. Witnesses told reporters there were around 1,000 people inside the hall, including prominent religious scholars. The Taliban condemned the suicide bombing against the religious gathering, saying the insurgent group had nothing to do with the attack. 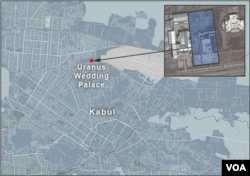 The Taliban’s denial strengthened suspicions the bombing could be the work of Islamic State’s Afghan branch, known as IS Khorasan Province or ISK-P.
U.S. Ambassador in Kabul, John Bass, tweeted that he is "Sickened and deeply saddened by tonight’s terror attack as the Ulema [clerics] Council marked the Prophet’s Birthday." He extended condolences from the U.S. government to the families and followers of those killed and wounded. 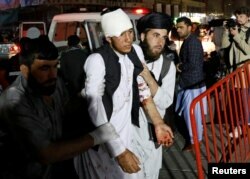 Afghan men carry an injured person to a hospital after a suicide attack in Kabul, Afghanistan, Nov. 20, 2018. Amnesty International also denounced the bloodshed in Kabul as a deliberate attack on civilians that constituted a war crime. VOA's Afghan Service and Ayesha Tanzeem contributed to this story.